For a food lover the very name of any tasty food item will bring sweet memories of its mouth-watering taste. In India the land of Ayurveda, the traditional food taken by our ancestors contained with ingredients to give all the six tastes needed lead a healthy life. The food of olden days included tastes such as astringent, pungent, bitter, salty, sour and sweet tastes. Unlike the food preparations from other countries where the nutritional value of food is mentioned in terms of fat, carbohydrates, protein etc. contents, traditional Indian food provided the required nutrients in the form of tastes. While most of us are aware and experienced about bitter, salty, sour and sweet tastes the pungent and astringent tastes are not known to us. Astringent has the unique property of reducing the fat content in a human body. It reduces the body mass and absorbs excess water. It cures diseases such as dysentery and excess sweating. It is normally found in herbs, fresh vegetables such as raw plantain, tender mango, turmeric peas, beans or lentils and fruits such as dried fruits, pears and pomegranate. The pungent taste helps in the organic process of our cell or metabolism and helps in improving the digestion process. It reduces the accumulated watery substance from the body and purifies the blood. 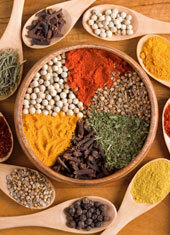 The food items that have the taste include spices, herbs, raw garlic, onion, ginger and chili peppers. It is one of the well-known tastes that is not liked by many, but it is the most important taste that brings the bests to our body. It has the unique property of detoxifying the human body to remove all the toxic wastes from the body. The process helps in making the body tissues lighter. It removes all the problems related to excessive thirst, burning sensation, itching and fever. The food items that have the taste include bitter guard, brinjal, Fenugreek seeds and leaves, garlic, sesame seeds, neem flower and basil seeds and fruits such as bitter melon, olives and grapefruits.